Liliput There are 11 products. 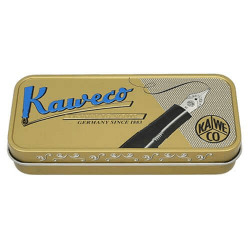 The LILIPUT is one of the oldest Kaweco series. In 1908 it already fascinated the consumers with its simple style, it was made of ebonite back then. Even today the Kaweco LILIPUT only consists of 3 parts: cap, barrel and mouthpiece. The LILIPUT series is available in different precious metals. Measuring only 97 mm when closed, just 87 mm when opened and 125 mm when the cap is attached to the barrel, the LILIPUT is one of the smallest fountain pens in the world.